Look for the Proudly Wisconsin Badge when shopping for cheese. Any brand of Wisconsin Gorgonzola, Parmesan or Fresh Mozzarella can be used in this recipe. Place basil, pine nuts, garlic and salt in food processor; cover and pulse until finely chopped. While processing, slowly drizzle in olive oil; cover and process until smooth. Add parmesan; cover and pulse until blended. Set aside. Bring balsamic vinegar to a boil in a small skillet over medium-high heat. Reduce heat to medium. Stir in honey; simmer and stir until balsamic-honey mixture is reduced by half and slightly thickened. Remove from the heat. Cool slightly. Spread 1 tablespoon reserved pesto on each bread slice. 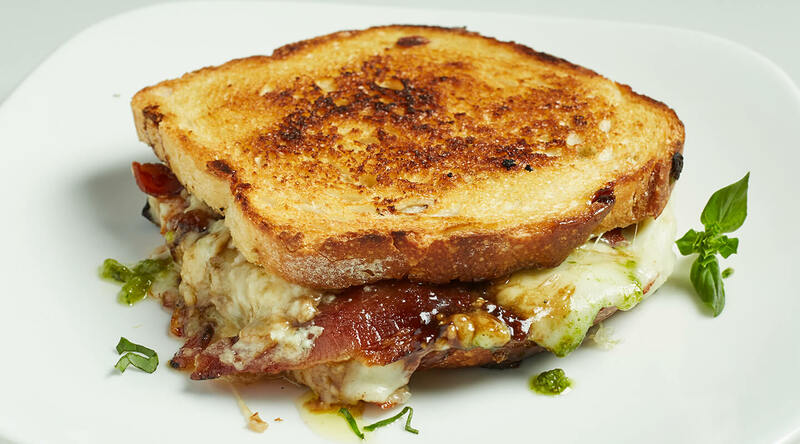 Layer four bread slices with mozzarella, bacon and gorgonzola. Drizzle each with balsamic reduction. Top with remaining bread slices, pesto side down. Spread outsides of sandwiches with mayonnaise, lightly pressing together. Cover and refrigerate any remaining pesto; save for a different recipe. Toast one sandwich, covered, in a warm, large nonstick skillet over medium-low heat for 2-3 minutes or until side is golden brown. Flip sandwich; cook, uncovered, 2-4 minutes longer or until bread is golden brown and cheeses are melted. Repeat with remaining sandwiches. The sandwiches can be prepared without covering them during cooking; however, covering them will help the cheeses to melt. Salemville® Amish Gorgonzola cheese is an artisanal blue-veined cheese that’s both creamy and crumbly. It's made in small batches; the cheese is popular for its quality and flavor.